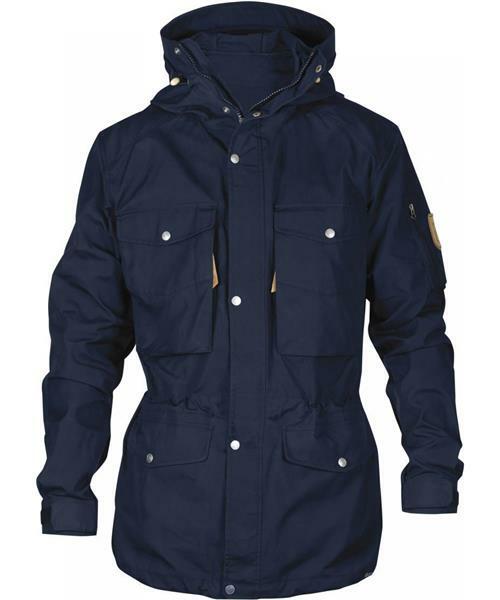 Robust trekking jacket in traditional Fjällräven style, perfect for long outings in the mountains in Scandinavian conditions. Made from durable G-1000 Original with a long cut and well-proven functions that make life in the wilderness easier. The material is wind and water resistant and can be impregnated with Greenland Wax for extra protection against wind, water and wear. Generous width with plenty of room for insulating garments under, and a bellow pleat at the back gives extra freedom of movement. A spacious hood with a foldable brim protects from bitter winds and can be adjusted so it fits the head perfectly. Two-way zipper that can be opened from the bottom for ventilation and a wide protective flap with buttons stops cold winds. Many pockets that offer practical storage for items needed close at hand; such as the spacious vertical chest pockets with zippers, with outer pockets on top of them with flap closures and buttons. There are also two lower pockets that are top loaded and an arm pocket with a zipper for a GPS or the like. Drawcord at the waist and hem and Velcro adjustments at the sleeve cuffs.